Item 869 Special Price: $149.00Can or $111.19us Brand New. Item 869: $149.00Can or $111.19us Brand New. 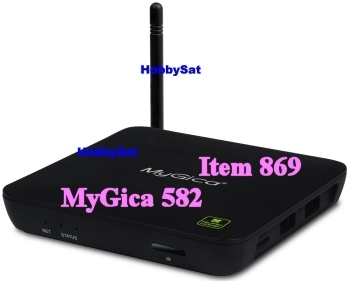 MyGica ATV582 Quad Core Nano Android Media Box is currently one of the top models on the market. The World’s First Quad Core CPU and Octo Core GPU Android TV Box. Clearer + Faster + Sexier = MyGica ATV 582. 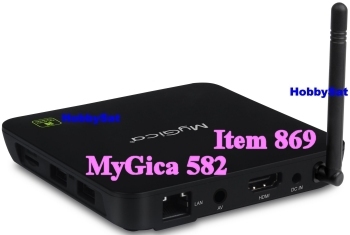 MyGica ATV 582 is a REAL Quad core Android box (AMlogic Processor) with True Quad core performance. Almost double the speed of other Android boxes using the Rock Chip Quad Core Processor. 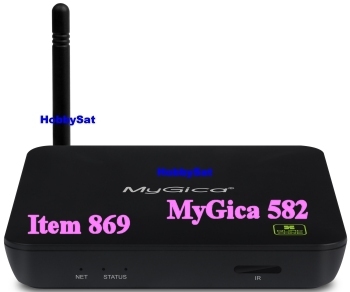 MyGica ATV 582 Supports 2k/4k Ultra High Definition, 4 Times the resolution of 1080P. 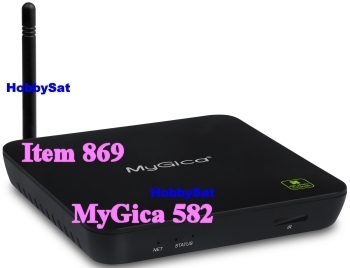 MyGica ATV 582 comes preloaded with Android 4.4 KitKat and XBMC 12.2. (supports official version of 13.1 Gotham). Newly designed remote control with numbers and preset functions. More memory with 8GB Internal Memory. •AML8726, ARM Cortex A9 x 4, Quad Core Mali-450MP GPU, frequency is 1.6-2.0 GHz, RAM is 1G, built-in 8G flash memory. •Supports UHD 3840 x 2160, H.265 video decoding. •Powered by Android 4.4 OS. •Built-in browser and supports virtual private network access. •Supports 1080P video local media playback from SD card or USB HDD. •Built-in 802.11 b/g/n WiFi module with antenna inside. •HDMI video output, connect to HDTV for HD video playback. •2 external USB interfaces, supports mobile HDD. •Supports weather, calendar, and desktop clock gadgets. •Supports USB mouse and keyboard operation. •Supports simple IR remote control with mouse function. •Supports Flash Player 11, online video playing. •Supports music player, picture player and more family entertainment. •AppInstaller for application installation from USB/SD. 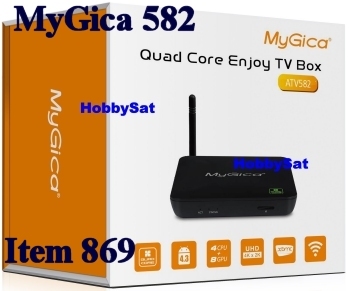 ATV582 Enjoy TV Quad Core Nano. Product: ATV582 Enjoy TV Quad Core Nano. CPU: Quad Core Cortex A9. UI: Android 4.4 system and Media launcher. Media Player: Local video playback including Mpeg 1/2/4, H.264, VC-1, WMV, AVI, MKV, MOV. Online Video: Access to internet, online video playing. Music: MP3, WAV, WMA music playback. Online Music: Access to internet, online music playing. Picture viewer: Supports multi formats: BMP, JPG, TIF, PNG, GIF. Software update: Supports Micro SD card for software update. External storage: Micro-SD card, USB storage support. USB: Supports 2 external USB HOST, USB 2.0. SD card: 1x Micro SD Slot and up to 32GB. HDMI: HDMI 1.3 and AV output. Remote control: Motion remote with IR learning functions. Resolution: 1080P, 1080i, 720P, 720i etc. Product Size: 100mm(L) x 100mm(W) x 15mm(T). Remote Distance: 8 Metres Visual.